While we at ‘Web Design South Africa’ are currently developing the new website for South African Bronze Sculptor Richard J. Gunston, we took some quick snapshot impressions from the current Art Exhibition in ‘THE STUDIO’ in Kalk Bay, South Africa, where the artist exhibits some of his small animal bronze sculptures – toads, suricats, velvet monkeys, birds, a beautiful bronze foal and miniature fighting hippo bulls – by invitation of Marc Alexander who is showing a collection of paintings and drawings. 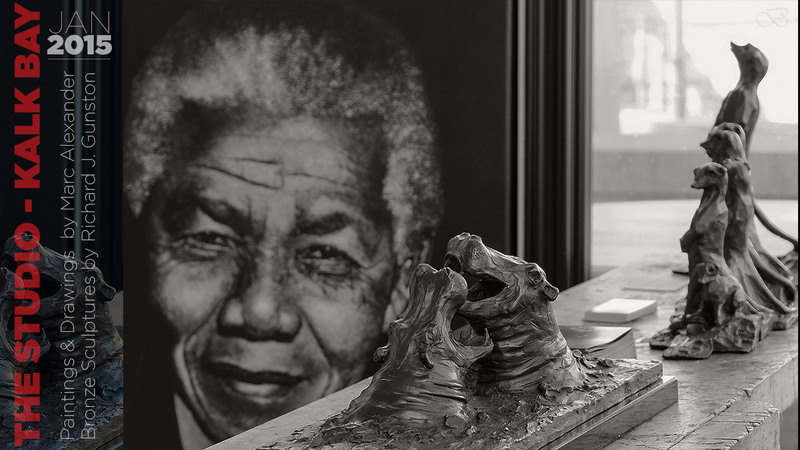 On the above photo, you see the hippo bronze in the foreground with a funny family of meerkats (suricat) looking on, while an impressive black and white portrait of our beloved ‘Madiba’ – the late Nelson Mandela – keeps smiling at the many talents of our ‘rainbow nation’. THE STUDIO GALLERY is easily accessible from Kalk Bay Main Road. The exhibition runs until 28 January 2015, opening hours are 10 am to 5 pm. Enjoy… more to follow soon! 2015 starting with a Big Bang! There is one sound you will never forget once you’ve heard it once… and that is the screaching rotor blades of a fire fighting helicopter thundering past your home. Well, it feels more like going through it… shaking your heart and bones! 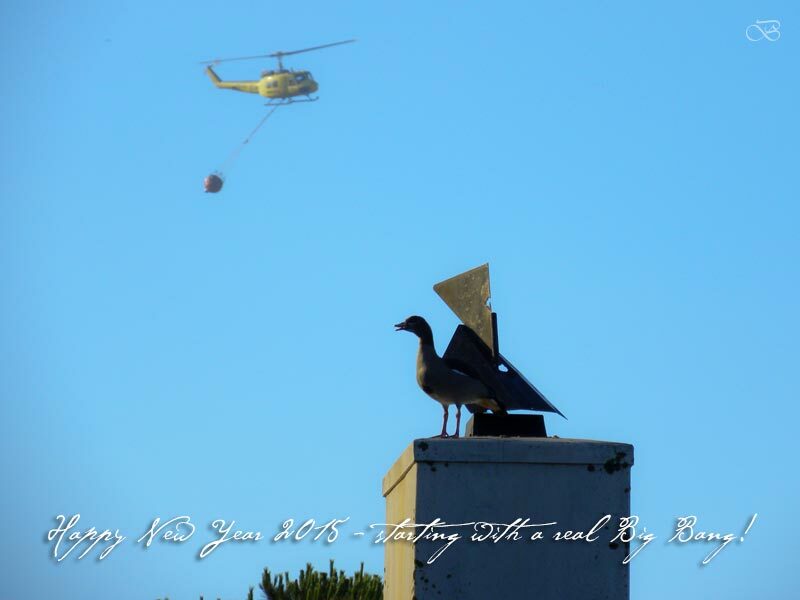 That’s how our New Year’s Day 2015 started with a difference here in Noordhoek, South Africa: with a massive Big Bang! that instantly, and brutally, terminated the valley’s peaceful slumber in the early morning hours. It was burning right next to us, above the vineyards. Once again, the violent beast was blasting down the mountains, reminding me of the drama we went through exactly 15 years ago, almost to the day. Again, two helicopters were flying nonstop, collecting water from the dam, and then rising up into the mountain to extinguish the flames; the whole operation coordinated from a third plane. Strangely, I could not smell the fire, which I usually do long before it reaches us. But – luckily – it was a windstill morning and, after about three hours of relentless flying and extremely focused work by the courageous pilots, the beast went to sleep… and it did not awake again. Finally, my blue agapanthus rejoiced and welcomed the new year. 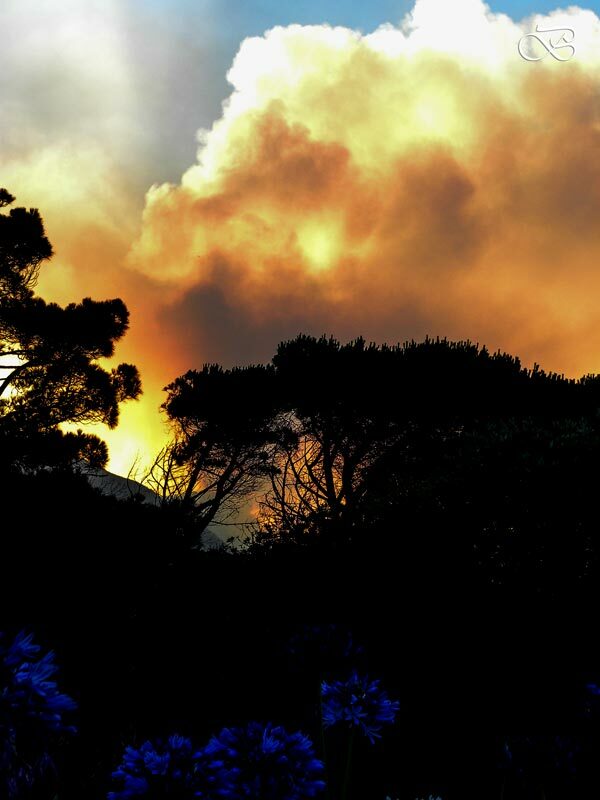 I remember that today, the 7th, 15 years ago, we had the historic and devastating ‘Cape of Flames’. May we be spared a repetition – but let’s light our inner fires to embrace an astonishing new year filled with opportunity and many chances to love, to grow and to share!